Garett Franklyn joined Moore Ingram Johnson & Steele in 2017 as an associate in the Knoxville office. Prior to joining the firm, Garett practiced in Memphis handling federal and state criminal and civil matters. His practice is primarily devoted to civil litigation with a focus on workers compensation. Garett was raised in Murfreesboro, Tennessee. He earned his law degree from the University of Tennessee in May 2016 and received a B.A. in philosophy and a B.S. in mass communications from Middle Tennessee State University in May 2012\. 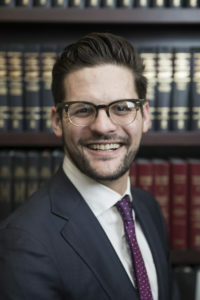 While in law school, Garett was an executive editor with the Tennessee Law Review, where he received the Silver Pen award for exemplary case note and the Galligan and Ramsey editing award. As a student, he worked for several Knoxville law firms, was a research assistant for three professors, and interned with the Tennessee 16th Judicial District. He was admitted to the Tennessee bar in 2016 and is a member of the American Bar Association, the Tennessee Bar Association, and the Knoxville Bar Association. Garett currently lives in Knoxville with his wife, Jennifer, where they enjoy hiking, traveling, and watching Tennessee sports.